One thing that has been truly beneficial to me this summer was actually going out of town with OUT my computer. I got to really enjoy my time with my family. Throughout the school year our children can be overscheduled, stressed out and plugged in to some or multiple electronic devices. It is pretty unavoidable; between iTouches, iPads, computers, video games and TV, kids spend a good amount of their day "plugged in". Summer is the ideal time to literally unplug your child. There is no homework and the weather is perfect for outdoor fun and learning. When you send your child to camp in Maine, the majority of camps do not allow any electronics whatsoever. At some camps the older kids can listen to music during quiet time in their bunks... but for the most part it's all about enjoying the beauty and nature surrounding them. Ronald Hall camp director of O-AT-KA feels "When you are enjoying what Maine has to offer, you don't need any outside distraction. You learn to appreciate the sounds of the wilderness." Kids these days have a lot of pressure on them, whether it's academically, socially or even when it comes to material objects; there is always competition over who has what. For those glorious weeks they are at overnight camp, they don't have to worry about all that. Everyone is on the same playing field. Pam Cobb, Director of Camp Runoia says "Some campers feel relieved to not be plugged in. They have a chance to decompress." When you give your child the gift of sending them to overnight camp, they grow in so many ways, and unplugging them for that time is priceless. Interacting personally with peers and staff, connecting with the incredible water and nature, encouraging self-discovery and skill development, are all the rewards of unplugging at Maine camps. 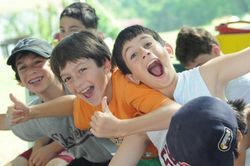 To find out more about all the amazing overnight camps in Maine, please visit Maine Camp Experience and start planning the best summers of your children's lives now!